Is There Life on Saturn's Moon? This image shows the wrinkled border of the Saturn moon Enceladus' south polar region snaking across this view, separating fresher, younger terrain from more ancient, cratered provinces. Controlled from 774 million miles away, NASA's Cassini spacecraft will swoop within 30 miles of the surface of one of Saturn's moons Wednesday, in an unprecedented flyby maneuver. In a moment long awaited by NASA scientists, the unmanned orbiter Cassini will pass through geysers of ice, water vapor and dust erupting from the southern pole of the 310-mile-wide moon Enceladus, in hopes of collecting fine particles. The 465-mile-high plumes shooting out from fissures, or tiger stripes, in the moon's surface, were first discovered during a similar but much more distant flyby in 2005. "This will be our closest flyby yet," says NASA scientist Candice Hansen-Koharcheck. "We knew that Enceladus was a very interesting target, but we had no idea that we would find the kind of activity that we found  water just spewing out of the south pole." The discovery in 2005 happened during the third flyby of Cassini's original mission, a four-year exploration of Saturn, which concludes in June. Since then, scientists have been carefully planning the trajectory for additional maneuvers during an extended mission for the spacecraft, proposed to continue through June 2010. If all goes according to plan, Wednesday's will be the first of eight additional flybys. Cassini will be 120 miles from the small moon's icy surface when it passes through the edge of the geysers. Future flybys will get as close as 16 miles from the surface of Enceladus  and 100 miles from the surface while passing through the plumes  but in this first close approach, scientists decided to proceed with caution. "We concluded that there really wasn't any point to push it on this flyby, especially considering that we've got seven more coming up in the next couple of years," says Cassini program manager Bob Mitchell. By collecting particles from the plumes of gas and water vapor bursting out of Enceladus at approximately 800 miles per hour, scientists hope to better understand the composition of the moon's surface in contrast to its interior  scientists believe that some of the plumes' water-ice particles emerge from within the moon and some bounce off its surface. Scientists also want to know whether there is any liquid water  an essential component to supporting life  below the moon's iced surface. "The thing that makes Enceladus so exciting is that all of the ingredients you would need to support life, as we know it on Earth at least, are there," Mitchell says. "We know there's ice," he adds. "The one thing that we don't know for certain is whether there is liquid water." The moon's plumes emit particles that are 90% water, in vaporized form, and contribute to the large rings around Saturn. "It's like the steam coming out of your kettle," Hansen-Koharcheck says. By analyzing the molecular structure of these particles, scientists hope to determine whether the vapor originates as ice or liquid, and whether that means there could be life in Enceladus's interior, beneath the surface of the ice. Additionally, they hope to get a better grasp on the remaining 10% of the particles. During the July 2005 flyby they were able to collect samples of particles that showed the presence of organic materials including carbon dioxide and methane, which, along with water and energy, are essential to sustain life. For larger carbon compounds, however, the results were less clear. As Hansen-Koharcheck puts it, "The data gets really noisy." Scientists hope that clearer data will reveal information about why the geysers formed. The leading theory is that Saturn's gravitational pull puts stresses on the moon, causing the fissures from which the plumes erupt. "Enceladus' orbit around Saturn is eccentric," Mitchell says. It's just enough off of circular that the effect of gravity on the moon is different from one point to another, and different from the planet's other moons. "That difference in the tug would be enough to cause the body to distort differently as it goes around Saturn." The friction created when sides of the tiger stripes are pulled apart or pushed together at different points during orbit may be creating the heat that ultimately causes the eruptions. In addition to collecting particles for analysis in an ion and neutral mass spectrometer, and a cosmic dust analyzer, Cassini will photograph yet unseen parts near the moon's south pole. It will also use infrared technology to create a comprehensive map of surface temperatures at the south pole. Warmer temperatures increase the likelihood that there is water in liquid form on the small moon. 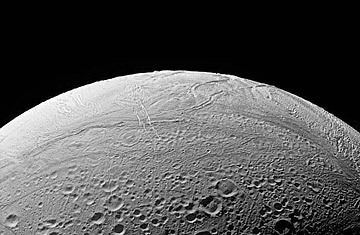 Hansen-Koharcheck and her colleagues are hopeful about their prospects of better understanding the structure of Enceladus  and what that will mean about the conditions in its interior. "It's one of these fun mysteries," she says. "It all goes back to this question: Could there be life?"